Cannabis related laws, regulations, and pubic opinion are rapidly changing. Leafly is operating at the forefront of these developments and elevating the conversation around cannabis and cannabis-related products and services. We created a digital infographic that continues to cement Leafly as the leading source of information on cannabis. 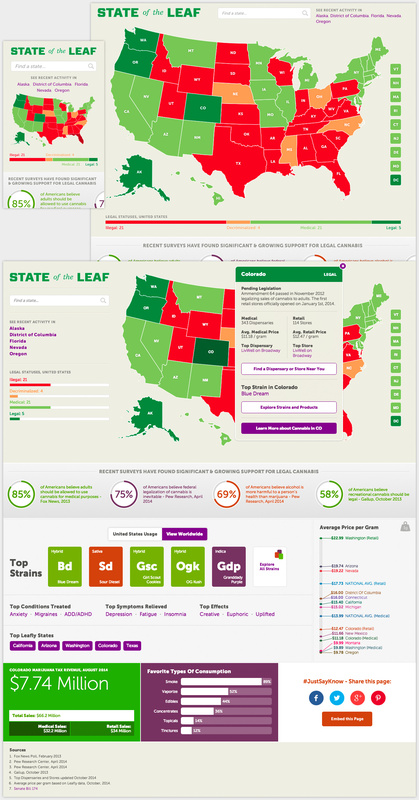 The page features a digital map that shows the current status of cannabis laws in each state, as well as related activity. Additional statistics, trends, and polling numbers help tell the story of growing cannabis usage and mainstream acceptance. The experience was optimized across all screen sizes, and the page can easily be embedded in to other sites. All data can be quickly updated by the Leafly team, resulting in an infographic that is up-to-date, in addition to being fully responsive.